(Kornfeld & Klipstein, Bern). 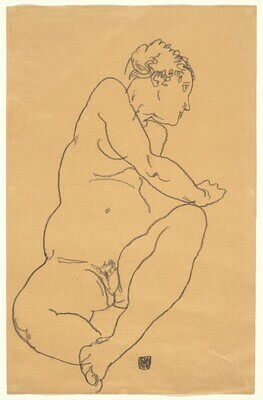 Felix Landau, Los Angeles, by 1968; (Felix Landau Gallery, Los Angeles, 1971); purchased by Ruth Cole Kainen, Washington, D.C. (her mark, not in Lugt); Gift to NGA, 2012. Egon Schiele (1890-1918): Paintings, Watercolors and Drawings. Felix Landau Gallery, Los Angeles, 1967, no. 40 (repro.). Weiermair, Peter, ed. Egon Schiele: Schriften und Zeichnungen. Innsbruck, 1968: 56, no. 21 (repro.). Kallir, Jane. Egon Schiele: The Complete Works, Including a Biography and Catalogue Raisonné. New York, 1990: 619, no. 2319 (repro. ).